From nationally-lauded San Francisco chocolate maker, Dandelion Chocolate, comes the first ever complete guide to making chocolate from scratch. From the simplest techniques and technology—like hair dryers to rolling pins—to the science and mechanics of making chocolate from bean to bar, Making Chocolate holds everything the founders and makers behind San Francisco’s beloved chocolate factory have learned since the day they first cracked open a cocoa bean. Best known for their single origin chocolate made with only two ingredients—cocoa beans and cane sugar—Dandelion Chocolate shares all their tips and tricks to working with cocoa beans from different regions around the world. There are kitchen hacks for making chocolate at home, a deep look into the nuts, bolts, and ethics of sourcing beans and building relationships with producers along the supply chain, and for ambitious makers, tips for scaling up. 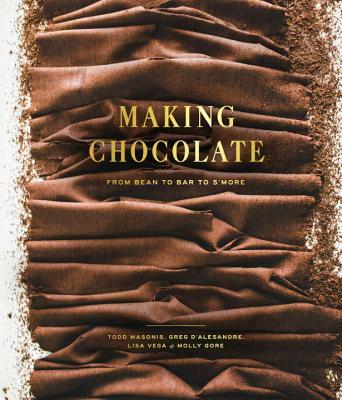 Complete with 30 recipes from the chocolate factory's much-loved pastry kitchen, Making Chocolate is a resource for hobbyists and more ambitious makers alike, as well as anyone looking for maybe the very best chocolate chip cookie recipe in the world. TODD MASONIS is the co-founder and CEO of Dandelion Chocolate. After leaving a career in Silicon Valley in 2009, when he and his friend Cameron Ring sold their start-up, Plaxo, he took a traveling sabbatical to study everything from the old chocolate making traditions in France to the best way to smash cocoa beans in his kitchen. In 2010, he and Cameron founded Dandelion Chocolate, a small batch, bean-to-bar chocolate factory in San Francisco's Mission District. In 2017, the company had grown into two factories in San Francisco, and one in Tokyo. GREG D'ALESANDRE is Dandelion Chocolate's vice president of research and development and chocolate sourcerer. He travels year round to build strong, trusting relationships with the cacao producers who partner with Dandelion Chocolate. He's been a product manager for Google, and designed laser tracking and torpedo guidance systems, but he knew he'd end up in chocolate since the day he "borrowed" liquid nitrogen from the physics lab in college to make frozen truffles. He feels strongly about direct sourcing cacao and building strong relationships with the network of cacao producers and chocolate makers around the world. LISA VEGA is the executive pastry chef of Dandelion Chocolate. After years in Michelin starred kitchens that incl​ude Gary Danko and Providence she now spends her time improvising unique strategies for working with single origin, two-ingredient chocolate. She was named a StarChefs Rising Star for San Francisco in 2016. MOLLY GORE is a food writer, former restaurant critic, and the Dandelion Chocolate communications manager. Her writing has appeared in Edible San Francisco, Texas Monthly, The East Bay Express, and other local outlets. Most recently, she co-authored a book about Western-style Japanese knives called Sharp (Chronicle Books 2018).